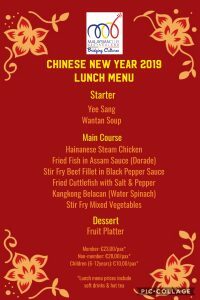 Chinese New Year 2019 welcomes the year of the pig. As a symbol of wealth and fortune, we would like to welcome the auspicious year with you on Sunday, 17th Feb 2019. Don’t miss it and come join us! All prices include soft drinks and hot tea. 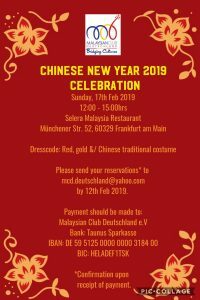 Please send your reservations to this e-mail address: mcd.deutschland@yahoo.com by Feb. 12, 2019. Please see the attached images for the details on the lunch menu.